Protein World, the supplement company behind 2015's infamous 'beach body' ads has been ordered by the Advertising Standards Authority to change the name of one of its products and to cease claims about its effects. The ASA today released a report following complaints made about two social posts made by the brand, whose posters asking "are you beach body ready?" were widely criticised, vandalised and banned on the London Underground in 2015. The posts in questions were both posted in May 2017, for Protein World’s Carb Blocker Capsules. 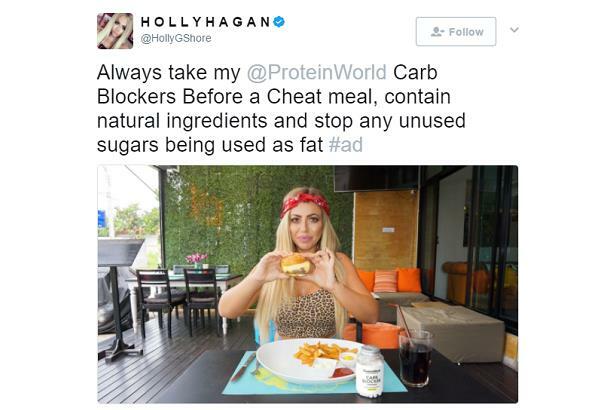 The first was a tweet (above) from Holly Hagan, who appeared in reality TV show Geordie Shore, for, which stated: "Always take my @ProteinWorld Carb Blockers Before a Cheat meal, contain [sic] natural ingredients and stop any unused sugars being used as fat #ad." 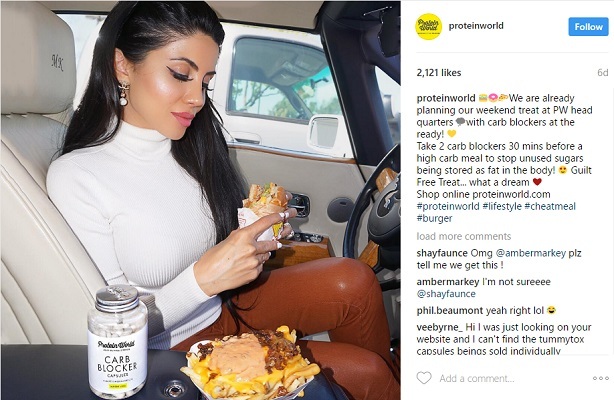 An Instagram post two days later from Protein World’s own Instagram account said: "We are already planning our weekend treat at PW head quarters [sic] with carb blockers at the ready! Take 2 carb blockers 30 mins before a high carb meal to stop unused sugars being stored as fat in the body! Guilt free Treat…what a dream. Shop online proteinworld.com #proteinworld #lifestyle #cheatmeal #burger." Two complainants challenged whether claims that the capsule could stop unused sugars from being stored as fat in the body breached the rules for marketing communications. The ASA said that Protein World had removed its Instagram post, and asked Hagan’s agent to do the same. Protein World said that its health claims were permissible, but also said it had been advised to add chromium to its product in order to substantiate those claims – and claimed that the use of the word ‘blocker’ implied that the product impeded the effects of carbohydrates on the body rather than completely preventing it. However, the ASA rejected that suggestion around wording, and said that Protein World "did not provide evidence that demonstrated their product contained sufficient quantities of trivalent chromium to meet the conditions of use associated with either of the authorised health claims". In its conclusion, the ASA says: "The ads must not appear in their current form. We told Protein World not to make health claims for foods if they were not listed as authorised in the EU Register. In particular, they must not use the product name 'Carb Blocker' or claims such as 'stop any unused sugars being stored as fat' in their advertising." However, Protein World has told PRWeek that National Trading Standards has approved the 'Carb Blocker' name and that its use is supported by its retailers Boots, Superdrug and H&B, which the brand argues would not stock products found to be outside of these regulations. A spokeswoman for Protein World said: "Protein World followed the National Trading Standards guidelines before the release of the product and all product claims and name were substantiated in accordance with these regulations. The posts from Holly Hagan did fall short of the ASA guidelines and were removed with immediate effect." Commenting on the case, Porter Novelli's UK head of healthcare Nicole Yost said: "I think there are many health claims made by companies in the food and nutrition space that are often unfounded, exaggerated or unsubstantiated. Social media tends to amplify the problem as in this Protein World case - the danger is that consumers will often believe what they want to see. "It is a good thing the ASA has banned these adverts. Proper clinical trials and robust data are the foundation of health benefits and efficacy claims - without these how can we trust anything a company or its influencers are saying."